In the 1960's I continued my interest in artists or performers. I have often returned to these subjects in various disguises - perhaps always about the issues in my life. 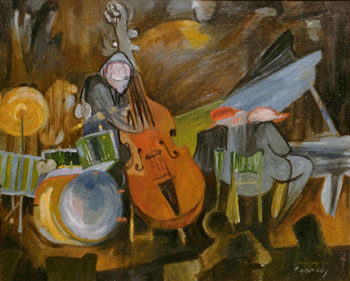 Jazz musicians, and the settings they perform in, played a very important part in the way in which I painted. While I may have made preliminary studies, the improvisational approach towards expression gave me the framework that I used in developing my work. 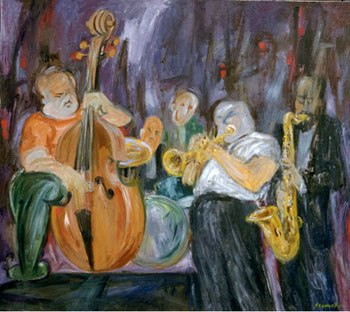 Jazz gave me more freedom to alter elements and become more abstract in my representation of real life subjects. I rarely painted directly from life. Paint was applied thinly during this period. Color started to become important, although the paintings relied heavily on tonal qualities. Color and tone were used to evoke a mood. 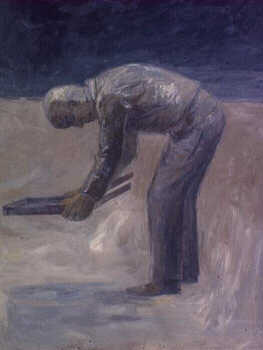 My earlier paintings, landscapes, were often limited to earth colors in a small range of values. Click on highlighted numbers for larger images.